In this video David Abbott discuss various key components of landscaping in Calgary. Chinook Landscaping and Design has been involved in and created some unique and interesting projects. Landscaping is our passion and Chinook Landscaping Calgary loves to landscape and it shows! Typical concrete front steps are everywhere in Calgary and quite frankly they can be quite boring. Considering the front step is the entrance to your home it is important to dress it up a little and welcome visitors with something other than boring cold sterile concrete. The front steps we built for this project were built with tumbled roman Pisa stone. Inset in the steps are roman euro paving stones. The front paving stone patio approaching the steps where made with similar matching materials as the steps. Roman Euro mowing pavers help define your borders. Using a paving stone border around your garden beds is a great way to define your borders. Defining your borders is key to a great looking landscape. Mowing pavers make it easy to mow right over your lawn without the hassle of having to trim around raised border edges. Our paving stones are installed with a compacted gravel base that helps prevent frost heaves in the winter time. It is very important to have a proper base under your paving stones or you will end up with uneven pavers in a very short time. We install polymer sand in-between our mowing pavers to help keep the weeds and grass from growing in between the pavers. A beautiful paving stone patio is the focal point to most back or front yard landscapes. Paving stones are more costly than concrete and exposed aggregate but the look is much more attractive. For this project Chinook Landscaping Calgary installed Trafalgar paving stones and implemented a unique application of cutting the paving stones around the beautiful backyard tree. The trafalgar paving stones have a classic timeless look that will not become outdated in the future. Again, we used polymer and in between the paving stones to prevent weed growth. Fences are the back drop to your landscape. Many people focus on their landscaping and forget about one of the key components to their landscaping. The backdrop of your landscaping is your fence so make it a beautiful, long lasting fence that will compliment your existing landscaping. Most landscaping companies use 4 x 4 fence posts for their fence installations but at Chinook Landscaping Calgary we insist on either 4 x 6 or 6 x 6 posts. The fence posts are the spine of your fence and installing flimsy 4 x 4 posts will mean you have a weak fence, especially in Calgary’s freeze and thaw climate. Installing 4 x 6 or 6 x 6 fence posts will insure your fence will stay upright and solid for years to come. Fences are a very important part of your landscaping both for aesthetics and for security. 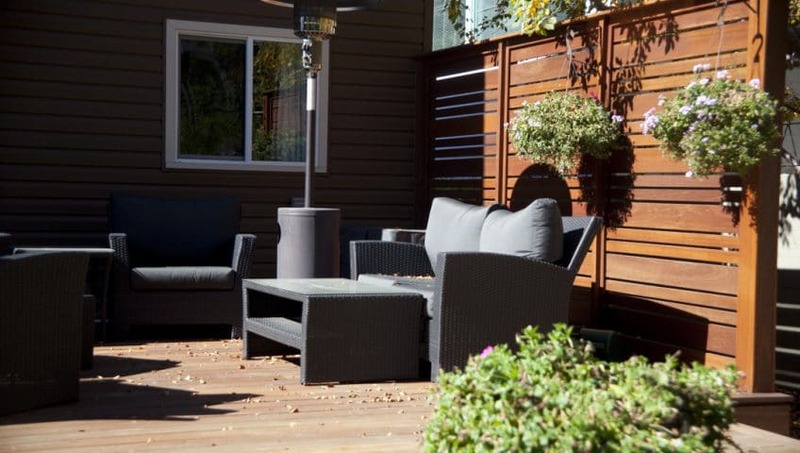 Chinook Landscaping Calgary is your one stop for unique, long lasting and beautiful landscapes. Call us today for your free onsite consultation. Ph: 403-452-8552 or visit our estimates page.